LEAF College Savings Gift Cards allow you to give a child in your life the gift with the brightest future. LEAF College Savings charges a small activation fee to the gift card purchaser just like prepaid debit gift cards from your local grocery store. A LEAF gift card recipient, or their parent, can redeem the card on the LEAF website and transfer the full face value into any college savings 529 plan in the US for no additional fee. You don’t need to have the account information for your gift recipient. No asking for coupons from the plan holder either. Your gift recipient may not have opened a 529 plan yet. This could be the gift that gets them started on the path to college savings. LEAF Gift Cards are consumer friendly: if for any reason your gift card is not redeemed within 90 days, we'll give you the option of receiving a refund of the full face value of the card. LEAF Gift Cards come with the assurance that your gift can only be used towards college savings: no more “college savings” checks that end up paying for groceries. LEAF Gift Cards are issued by CBW Bank, Member FDIC, and your funds are fully insured throughout the transfer process. LEAF Gift Cards can be sent via e-mail, Facebook, physical card, or print your own which you give to your gift recipient instead of just letting them know you made a contribution to their college savings account. With LEAF Gift Cards, you have access to a Combo Gifts from our partners like Amazon Gift Cards and Cricket publications. When you redeem a LEAF Gift Card, you are making a contribution into your own account so there are no plan restrictions on gift contributions. 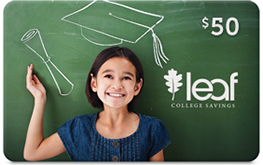 LEAF education gift cards can be purchased in any dollar amount from $25 to $1,000. Recipients, or their parents, can redeem cards on the LEAF website and transfer the full face value into any college savings 529 plan in the United States. Recipients can redeem the cards even if they don't have a 529 plan. LEAF will encourage them to open a plan and they can return to the LEAF website to simply transfer the funds later.